The Learjet limo nightclub on wheels. The Learjet limo ensures that the world of automobile concept cars is never dull. The conversion of a Learjet into a limousine is the work of designer Dan Harris and Frank DeAngelo, the owner of the Learjet. 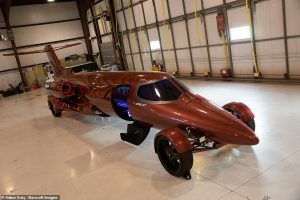 The unique, and it truly is unique, at least for the moment, because only one has been constructed, cost more than $1 million to build and is selling for $5 million. The Learjet limo is based on a Learjet 28 private aircraft that was produced between 1977 and 1982. The Mail Online describes it as a “nightclub on wheels,” indicating that it trumps drinking champagne in the back of a stretch limousine. It carries eight passengers; so it is a very exclusive kind of club. The limo has four 28-inch wheels attached to a wingless Learjet fuselage and took 12 years to make. It was developed by the Illinois-based Jetsetter, Inc based in Lakeville, Minnesota, USA. The Learjet limo is powerd by a V-8 engine rather than a jet engine and its interior is packed to with lights, speakers, screens to create a nightclub ambience. As well as a large screen at the rear, there is a row of side-facing recliner seats and the driver gets plenty of space inside the cockpit with a bucket seat for comfort. The exact dimensions of the so-called Learjet remain unknown but, according to Mr DeAngelo, this element mystery and intrigue is part of its appeal. He told the press, “We’ve had people pull over on the side of the road, get out of the car and video tape the limo.” Well, there’s a surprise! As if most people wouldn’t stop to gawk at a Learjet whizzing down the road instead of flying high in the sky. Jetsetter, the company behind the ‘contraption’ envisages that it is more likely to be used for corporate launch events than for a trip to the supermarket, and most people would agree that parking it will pose some issues. Have you tried Titanium Luxury Hire’s Exclusive Concierge Service? We can arrange your Private Charter Flight, Luxury Exclusive Villa or Super-Yacht for you. Call us now for more information. « Is an uncrashable Mercedes Benz possible?